The definition proposed by Fékété needs to be modified to include the whole spectrum of CES. The histopathologic picture of the intrinsic type may show fibromuscular disease (FMD) or tracheobronchial remnants (TBR). 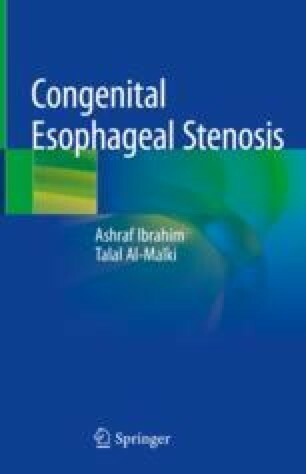 CES can be an isolated lesion or associated with esophageal atresia and/or tracheoesophageal fistula (EA and/or TEF). The presentation can be early or late. Some may have a benign course whereas others may have a very stormy one. TBR needs to be differentiated by means of histological examination at the anastomotic site or using miniprobe endoscopic ultrasonography. Dilatation is usually the initial management. FMD responds better to dilatation, whereas the TBR usually needs resection. The development of the esophagus and trachea is due to simple reduction of the size of the foregut, caused by a system of folds that approximates, but do not fuse. The imbalance in the growth of this set of folds would lead to different forms of malformation. Advances in genetics and molecular biology, lead to focusing on the process that occurs at a cellular level and gene patterns of expression and elucidating signaling pathways. The congenital membranous disease (MD) has been considered to represent a missed form of EA. The Fibromuscular disease or stenosis (FMD) has no clear embryologic or pathogenic factors to explain these lesions. The Tracheobronchial Remnants (TBR form) occurs as a part of spectrum of anomalies, including EA/TEF, related to separation of the foregut from the respiratory tract around the 25th embryonic day.